Before we jump into the meat of today's post and see how we can get more customers from marketing automation, we wanted to take just a moment to talk about the concept of marketing automation at a higher level. To boil it way down, marketing automation basically just means that there is a software that automates your marketing for you. Now the idea isn't to automate your processes to make less work for you, although that will come with the territory. The goal is help you convert more leads and customers. The less work (at least more efficient work) is just icing on the cake. While marketing automation might not be necessary to your inbound marketing efforts, it will surely produce better results and help you reach your marketing goals faster. How? Let's think about the different phases of inbound marketing for a moment - Attract, Covert, Close and Engage. In the Attract phase, you're trying to draw qualified visitors to your website. In the convert stage, you're trying to turn those visitors into leads. When you get to the Close stage, you're now focused on taking your leads and turning them into customers. And finally, in the Engage stage, you're continuing to interact and communicate with your customers so they keep coming back to you for more (upselling at its finest!). Marketing automation snaps into the middle stages, Convert and Close, and can really support your efforts as you're trying to generate more revenue for your company. When you're thinking about setting up an automation strategy that integrates with your marketing and sales efforts, it's important to realize that automation does require software. While you could (maybe) do it on your own, it would make your life extremely difficult and you would probably end up ripping your hair out in frustration, only to realize that you didn't get anywhere. Exactly why an automation software platform can help. How many emails do you plan to send? How many contacts are going to be in your database? How many more leads do you want to generate this year? Are you going to be leveraging blogging, social media, landing pages, emails, calls-to-action, lead nurturing, etc.? Or are you just going to be focusing on some of these areas? Are you trying to have a platform that helps holistically, or just particular pieces of your strategy? When we were considering what platform to choose for our own automation strategy, there was a very clear winner: HubSpot. 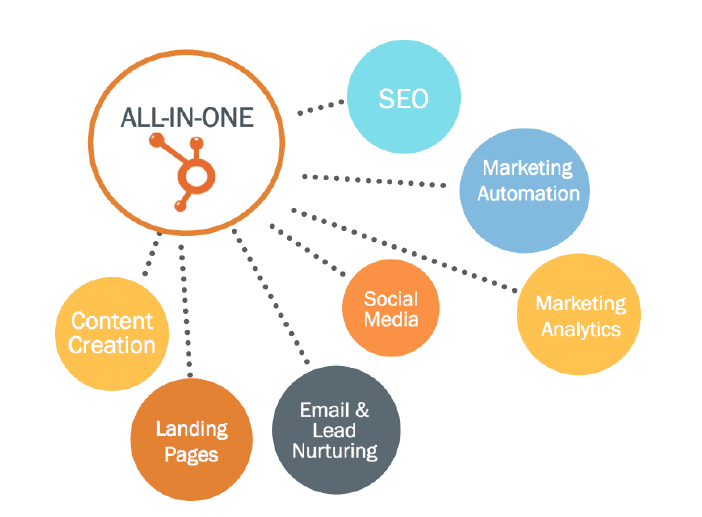 HubSpot stood out to us because it is an all-in-one marketing automation software, that we could use in each stage of inbound marketing. There are specific tools built for attracting (the right) strangers to your website, tools designed to help you convert those visitors into leads, then convert those leads into customers (marketing automation tools, in particular), and finally tools for us to use specifically to engage with our customers and keep them coming back for more. And let us just say, HubSpot has changed our business. Now we're not trying to turn this post into a sales spot for HubSpot, but we do think it's important to talk about why we chose this platform and how it has helped us achieve (in fact, surpass) our goals and has helped to grow our business. We know we harp on this point a lot in our blog posts and ebooks, but we feel like it's an important point to make when you're implementing something new into your business. Whenever we start a new inbound marketing engagement with a client, building a strategy is the first step we take. Together, we work through the business goals, we identify our ideal customers, we work on outlining a clear strategy to achieve our goals, and we guide them through the implementation. When you're building an automation strategy for yourself, whether you have the support of an inbound agency like New Breed or you're doing it on your own, you want to really think about these different aspects before you just jump in. Going from decision to execution without the planning phase in between is a recipe for disaster - and we have seen it happen time and time again. We can't stress this point enough. Think about the questions you asked yourself as you were picking a marketing automation software. Do the answers to those questions have concrete numbers and goals attached to them? If not, just write up a quick goals sheet. Or you can use our easy SLA template to help outline your marketing and sales goals. Once you have a clearly established strategy, the implementation phase is simple. You set it up, snap it into your process, push play, and watch the leads roll in...right? Well, yes and no. The first part is true. Implementation is easy when you have a well-defined strategy. Pushing play and watching the leads roll in is where that point falls a little short. Marketing automation takes time and effort. While it is designed to make your life easier, it's not going to do your job for you. Marketing automation is meant to automate some of your processes to help convert visitors into leads and ultimately leads into customers. By implementing the software properly, you'll start to see results quickly. And each of these different stages plays a different role in getting you more customers. Some of this post has been a little theoretical, perhaps a bit higher level, so this final point, we're going to get into the nitty gritty. We'll walk through an example of a marketing automation strategy in action and show how this can help you convert more of your leads into paying customers. The idea behind inbound marketing is to provide a visitor with valuable information that aligns with their pain points and solves their challenges. You're on board, correct? With that being said, you can't assume that every single visitor that happens on your site will be ready to buy, so you need to provide them with various content offers that speak to the different stages of the sales funnel they're in. Now, if you were to do this all manually, it would be a complete nightmare. But doing with this marketing automation? Much easier (meaning less of your time wasted). Let's see it in action, shall we? The screenshot above is of our homepage. Notice The first thing you see on that slider? Those little blue buttons are calls-to-action - we're asking the visitor to take an action after reading the text that is above it. Now, look more closely at the text in those blue buttons. The first says, "I Want More Leads"; while the second says, "Download the Guide". To us, someone who clicks on the "I Want More Leads" button is much more ready to purchase than someone who just downloads our free guide. It's showing us their intent; either they want to get more leads right now and want to talk to us about how to get there OR they are really just browsing and trying to learn more about how to get more leads (maybe on their own or considering taking on a partner). That being said, just because these two people may be at different stages in the buying cycle, it doesn't necessarily mean that the one who is downloading the guide is of less value to us. In fact, it could be quite the opposite, so we can't afford to miss this opportunity to convert them into a customer - it's just going to take a little extra time. Which is where our marketing automation strategy really starts to take effect. The person that chooses to download our guide, will be taken to a landing page. On that landing page they'll be asked to fill out their contact information in exchange for the guide. Once they do so, they're placed into an automated workflow, which we designed to nurture them through the sales process automatically. Starting at the top, a contact is added to the workflow when they fill out that initial form. Once they're on this list, the magic starts to happen. They immediately get a Thank You email with their download information. We then give them one business day to read through the guide, until we send them the next piece of content, in this case an Inbound Marketing Cheat Sheet. 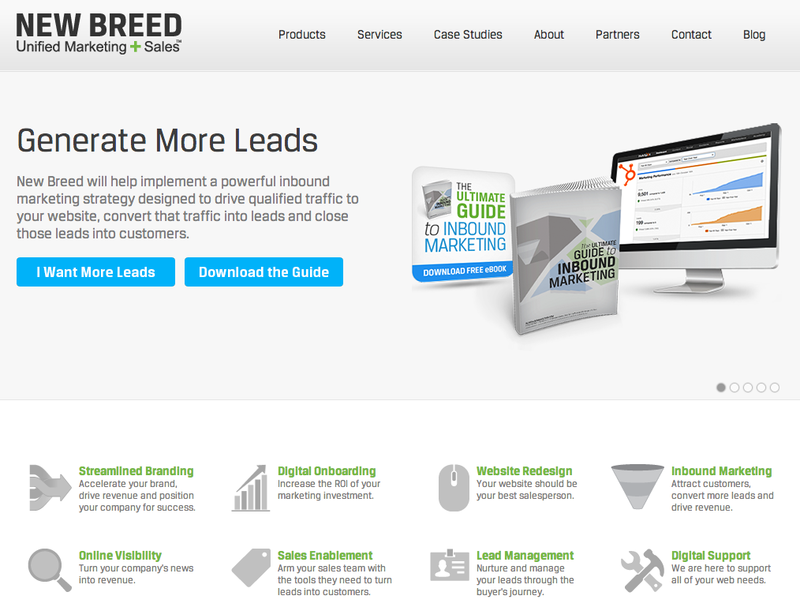 The Cheat Sheet in this case is a quick-glance guide they can use as they build out their inbound marketing plan (which they learned extensively about in the guide) - it's a follow up to the content they previously downloaded. Then once they've had time to review that offer, two business days later we send them an additional email offering a free consultation. The idea being that after they've had some time to digest the information they're reading, they'll be ready to speak to a member on our sales team and discuss their strategy and how we can help them meet their marketing and sales goals. 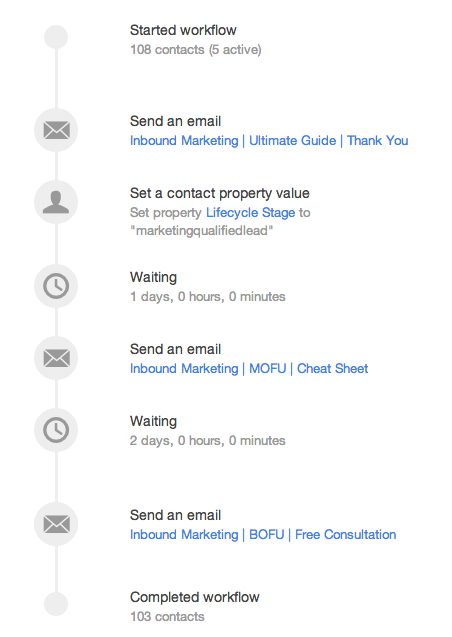 Granted, this is a simple workflow and you can get much more advanced with HubSpot, but we're just using this to demonstrate the power of marketing automation and how you can use it in your own strategy. You're taking a visitor on your website, presenting them with information that aligns with their interests, then sending them a follow-up message, designed to nurture them through the sales process without an actual member of your team holding their hand through it. It's more efficient (and actually more effective), with the end result being an increase in customers. Does an Automation Strategy Really Work? We know you're probably thinking it, so let's just cut to the chase. Yes, it really does! 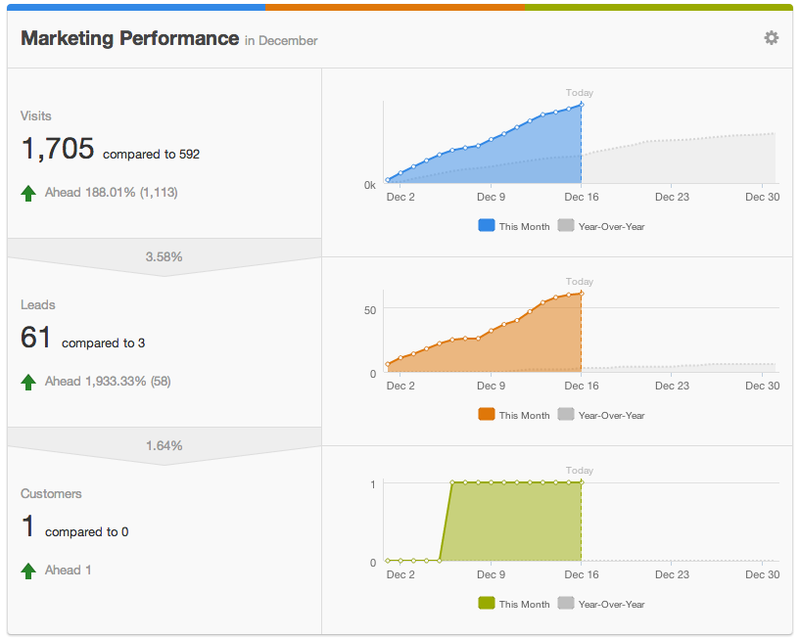 The graph above shows this month's metrics (Dec 2013) vs. this time a year ago (Dec 2012). As you can see, we have 188% more traffic coming to our site, from that traffic we have converted 1,933% more leads, and we've generated 1 new customer (compared to zero last year). Numbers don't lie, friends. With the help of our marketing automation strategy, we have been able to not only see an increase in these numbers across the board, but it's also been reflected in our net revenue. This year, we're expecting to see a 23% increase in revenue.